The Shape of Air was exhibited at Eramboo Artist Environment and comprised of works by installation artists Suzanne Davey and Ainslie Murray exploring the tangible nature of air and material echo. Curated by Greg Stonehouse the works investigate a range of ideas drawn from notions about air and immaterial space such as breath, presence/absence, the dissolution of architectural space and atmosphere. Both artists explored these notions through outdoor works in the Eramboo bushland as well as a range of process works in the gallery. Concepts introduced by Monika Bakke’s book ‘The Life of Air’ were explored, including thinking of air as a crowded perpetual motion component of place and as a dynamic habitat we share through the action of breathing with plants, animals (birds and insects) and microbial life. 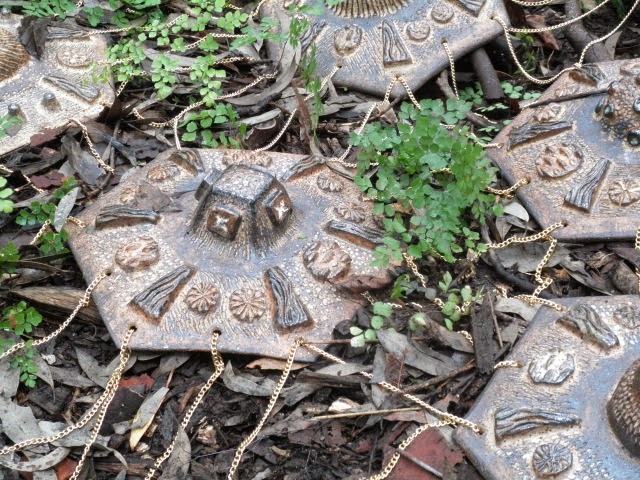 The works respond to the site by installation placement, using materials collected from it or by engaging with the unique and special characteristics of Eramboo as a place on the urban fringe, surrounded by wild bushland. The spatial intersections ultimately aim to investigate our dynamic relationship with the landscape; as a space where our bodies merge constantly with the environment. WIND SONGS is a dynamic, colourful installation that uses an everyday object, the humble umbrella, and transforms it from the ordinary into the extraordinary. A mass of umbrellas have been de-constructed and re-configured in new and surprising ways. The ‘fly away’ work responds directly to the elemental landscape of Manly and Dee Why. Floating in the sea breeze it sings songs about fragility, struggles and the power of transformation. ART IN ODD PLACES is an arts project exploring public space founded and directed by New York artist Ed Woodham. Three American and 25 Australian artists explore the many meanings of the theme, Number. From synchronised swimming, performance, sculpture, installation each artist has responded to the notion of Number in individual ways. 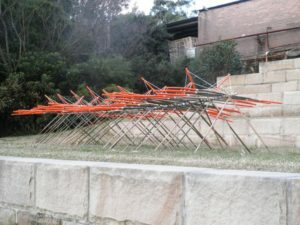 The project was a collaboration between Manly Council, Warringah Council and Eramboo Artist Environment. Project Rationale: Umbrellas are utilitarian objects charged with memories and a myriad of metaphorical possibilities. Nostalgia for summer holidays at the beach, fresh sea breezes, life saving flags, experiences of wild storms, rain and wind and our basic human need for shelter and protection are all evoked by the humble umbrella. Umbrellas are also delicate and fragile objects. In strong winds umbrellas have a tendency to ‘fly away’ and de-construct. On windy days at the beach runaway umbrellas cartwheel dangerously across the sand. On wild wet days locations such as the Manly Corso are littered with discarded rain umbrellas, sad and forlorn, inside out and broken. The installation is a large colourful, geometric canopy/banner/structure constructed from found and collected umbrellas and arranged together in a tessellated pattern. The installation responds directly to sea breezes, creates bold shadows patterns on surfaces and creatively expresses the umbrella’stendency to ‘fly away’ in response to wind. Through its dynamic composition, its re-construction and final transformation of multiple umbrellas into a new form Wind Songscan remind the viewer of……. everyday struggles: weathering storms, the whirl of life, the risk of the things we depend on de-constructing and flying away.